The Club was formed in March 1991. The inaugural meeting was held in Trevor Doig's carport. Trevor Doig and Russell McMahon had been mulling over the idea of starting a Budgerigar Club in the Mandurah/Murray district for several months. With our membership spread over a wide area and the majority of interested persons being retirees it was decided to meet on a Sunday afternoon at the Falcon Community Hall. President - Trevor Doig; Secretary - Jan McMahon and Treasurer - Russell McMahon. `The Mandurah and Murray Districts Budgerigar Improvement Society'. Our first meeting/exhibition on 21/4/91 was a huge disappointment. The inclement weather and the lack of promised support did not help our cause. `The South West Budgerigar Club'. Western Australian Budgerigar Council (Inc). The Club's first trophy winners [17/11/91] were Denny and Hilda Wildblood. Even at the end of the first year there was still uncertainty as to whether the Club could survive. Thanks to the help and support of the dedicated members at that time, the Club continued to grow and our survival was guaranteed. Our first Club Derby was held on 20th June 1993 and the winners were Denny and Hilda Wildblood. Judges: Pat and Willie Schoeman. 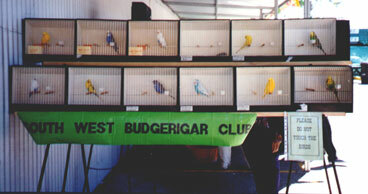 `SOUTH WEST BUDGERIGAR CLUB (MANDURAH) INC'. By this time the Mandurah and Rockingham Budgerigar Society had changed it's name to Southside Budgerigar Society (Inc) so our Club was free to include `Mandurah' in it's name. In our early years we conducted several shows/displays at the Mandurah Forum Shopping Centre. This gave our Club exposure and also raised much needed funds. In March 1996 we were invited to put on a display at the Comet Bay Fair organised by a local ratepayers association. We shared a marquee with a cake stall!! Conditions were rather cramped but we coped until a willy willy came right through the marquee and upended several of the cages from the staging. All the birds survived with the exception of one escapee which was last seen heading for the nearby bushland. For the first 5 years we held our meetings, competing with the birds, in the main hall at Falcon. The Lesser Hall became available in 1996 and to this day we still conduct our meetings in the peace and quiet of the lesser hall. Still anxious to increase our membership and club funds we took a display to the Murray Mandurah Markets at the end of 1996. The untimely death of one of our esteemed members, Ken King in 1998, saw the Club face a new challenge when we were asked to conduct an auction of Kens' birds. With the assistance of our members the birds had to be caught, catalogued and caged including some pairs in breeding cabinets with youngsters. The auction was a great success with 20 bidders attending and several thousand dollars raised for Ken's widow. As a `thank you' to the Club we received a commission on the sales. Thanks to Sharon House we were delighted to welcome Ron Hunt, an accredited Australian National Budgerigar Council Judge, to our Club in April 1999. Ron judged the birds in front of the members and then gave a brief talk, followed by a question and answer session. Members were very appreciative of the opportunity to meet Ron and found him to be one of the most informative and interesting visitors to our Club. 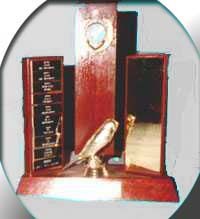 February 2000 was another milestone for our Club when we affiliated with the Western Australian Budgerigar Council (Inc). Judges were allocated by the Western Australian Budgerigar Council (Inc) for our monthly Table Shows and it also entitled the Club to representation at Council meetings, however, we did not have voting rights. The Rare Budgerigar Club of WA Inc.
2004 has seen major changes in Western Australia with the Western Australian Budgerigar Council (Inc) reverting back to an advisory/controlling body in Western Australia and the South West Budgerigar Club (Mandurah) Inc and the Metropolitan Budgerigar Club of WA (Inc) becoming affiliates of the WABC (Inc). The affiliation entitles the clubs to judges, rings, magazines and a say in the running of the hobby in Western Australia. Trevor Doig, Russell McMahon and Denny & Hilda Wildblood. Trevor Doig: President: 91 - 92, 95 - 97, 98 - 99; Vice President: 93 - 95, 99 - 02 and Show Manager: 92 - 94 and 97 -98. Russell McMahon: Vice President: 92 - 93, 97 - 99; Treasurer: 91 - 92, 95 - 97 and Committee Person: 93 - 94. Denny Wildblood: Committee Person: 96 - 98 and Trophies Officer: 99 – 02. Hilda Wildblood: Accessories Officer: 99 – 01. 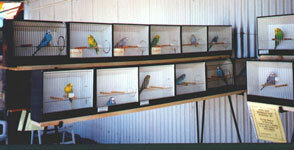 All these exhibitors were also members of the Western Australian Budgerigar Council (Inc) at the time of entry. Jeff Lloyd, Len and Gail Vinci, Rob Hugo, Bob Levy and Colin McCavana have been exhibiting at the Nationals for many years but are/were also members of SWBC (MANDURAH) INC with Western Australian Budgerigar Council (Inc)/Metropolitan Budgerigar Club of WA (Inc) still being their primary club. During 2001 and 2002 the Club experienced a very encouraging increase in membership and also the number of birds being benched at our monthly shows. 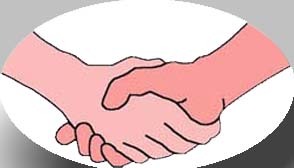 The Club, in order to cater for our members, some of whom have between a 200 and 300 kilometre round journey to attend meetings, decided to meet at 11.30am This allows more time for judging and enables members to arrive home before dark. Under the guidance of President, Cec Gearing, the Club has taken on a renewed enthusiasm. After Cec's election in 2001 he presented members with a package that included many new innovations. With the exception of the Derby, all the events listed below, have been suggestions put forward by Cec and after consultation with the membership they have been enthusiastically implemented. Late in 2005 the Club moved from the Falcon Community Hall [listed for refurbishment] to the Coodanup Community Centre. The new venue is proving to be a resounding success. The hall is bigger, lighter, brighter and has fantastic kitchen facilities. The general consensus of opinion is that we make this our `home'.